Based upon your device you will be looking at an adapter in one of four categories. A general purpose adapter, a device specific adapter, a BGA adapter or a module. Below I will describe how to select the correct BGA adapter for your device. To provide the most effective solution for BGA adapters, we have split the BGA specific adapters into BGA-Top and BGA-Bottom boards which are offered separately. This results in reduced cost if you need to program multiple devices in the same BGA package - you can use the same BGA-Top board with different BGA-Bottom boards. BGA adapters are made to order and as a result have a typical lead-time of 7 - 10 days and are non-refundable. 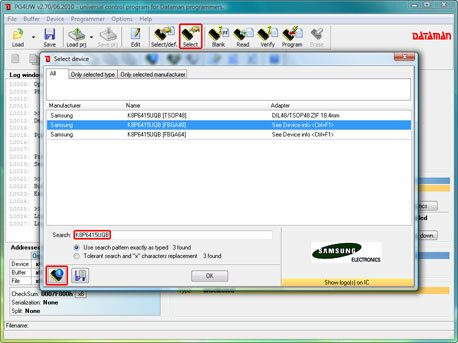 All the information required to select the correct BGA adapter can be found in the control program for the programmer. This can be done without the programmer connected but make sure to select "DEMO" when prompted. Open the control program, click "Select" and enter the part number of the device you would like to program into the "Search" box. When you have found the device you would like to program, click on it once so it is highlighted. Click the "Device info" button and a new window will open displaying further details about the device. 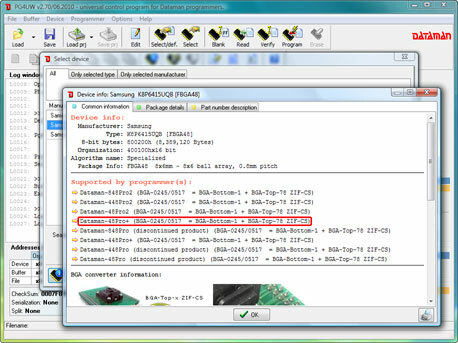 The "Common information" tab shows the programmers which support the device and which adapter is required. If the device is to be programmed through the ISP connector, then no adapter is required. In the case that no adapter is listed or it is not clear which adapter is required or if you would simply like confirmation of the correct adapter then please submit a Technical Support Request and our support team will respond in 24h.